Hello Friends! 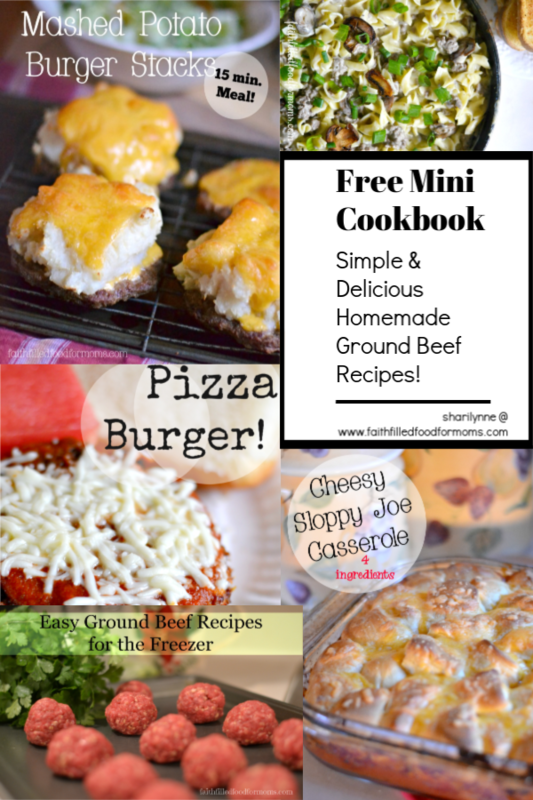 I’m super excited to offer you this Free Mini Cookbook Simple Ground Beef Recipes. Most are very quick to make and some you can even make ahead and freeze for later! Life is busy these days, so you’ll definitely want to grab this one. I’ve also included some tips and ideas for what I use ground beef for and ways that I save time and money in it too. I have not included pictures of any of the recipes in the cookbook because I know that pictures can be VERY ink intensive and the whole point of me preparing this free mini ground beef cookbook is for you to save money! If you are like me though and you like to see pictures of the food you are going to make, at the bottom of each recipe is the web page for that recipe. Feel free to hop over and take a look. YUM! Use this form and Sign up below! Send your friends and family over to grab their copies too! More Easy Recipes you may enjoy! Wow! Whatever is on the front cover looks delicious! Thanks for putting together a book and making it free for a bit. I’m always looking for new ideas in the kitchen. Thanks for the recipes I’m always looking for new recipes. Followed you here from the Family Fun party. I am sooo glad to have found your website! I have completed my subscription and registration but for some reason i could not download the recipe booklet. Could you please advise on this issue, or you might be sending it to my email? Hi Gihane! I’m so sorry that recipe booklet didn’t work..I’ll check on it! In the mean time here I will email it to you! Don’t forget to check your spam file …just in case I get lost in there. I’m so happy you found the website so helpful. Have a blessed weekend! Not working for me either. Can you email it to me too? Emailed the Cookbook(let) Enjoy and blessings! In the same boat…..couldn’t figure out how to access the cook book(let) after registering! Hi Brianne! Emailed to you! Blessings! Not able to get the recipe booklet. 🙁 Clicking the pic does not help and the link only takes me to twitter(I do not have). Any way I can get the recipe booklet? Hi Darcy! So sorry about the problem for downloading book…we are working on it! In the meantime please click on the link below. It will lead you to the download! Thank you so much for your patience and for letting me know that it is STILL not working. boo hoo. Yum! These ground beef recipes look great! Hope you have a blessed Wednesday!